That's handy, so I could have changed the external port for the XBOX from 80 to say 85, but still have that then translated to the internal port 80 for the XBOX. Here is a screen shot from my BT router. Because I had two "user defined applications" both containing the external port 80 one for the XBOX and one for the WHS 2011 box the BT router would not let me continue and have both enabled at the same time etc. Edited by cw-kid, 02 September 2015 - 09:47 AM. Yeah, that's right, although, it depends on the use of the 80. Is it so you can manually connect to it through a browser or something, or is it for some service that connects to it? If it's a service, they will be expecting to connect on 80, not 85. 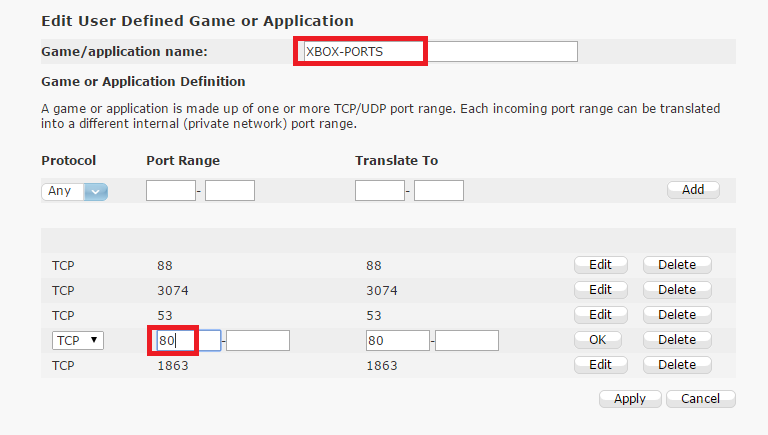 Well port 80 on the WHS 2011 box is for remote access and port 80 on the XBOX I don't know, that is just one of the ports Microsoft support say to port forward. So might be better changing the WHS user defined application on the BT router then and leaving the XBOX one as 80. Edited by cw-kid, 02 September 2015 - 09:41 AM. Should the domain name be in the quotes? "http://mydomain.com" or without the quotes? Hasn't anyone hacked this yet?? I know the last one was locked down but the newer ones were more hackable weren't they??? Hacked what? The FW so it runs Roku FW? That'd be nice! In terms of what type of hack ?? The developer mode is still available, which allows you to side-load the Emby app. The new black box has just arrived. I can't seem to access the Dev mode however in the browser. I entered the remote control buttons to enable Dev mode, I then see the enable Dev mode page and it says to click a button to enable it and restart. However after the restart I am unable to access the box via its IP in the browser, it says this web page is unavailable. I'm on a wired network at the moment. I can ping the Now TV box though. Tried in Chrome and IE. Edited by cw-kid, 05 September 2015 - 07:13 AM. I disconnected the network cable and enabled WIFI instead, I then entered the buttons again to enable Dev mode, this time after selecting the Enable and Restart button, I then was presented with some T&C and a "I Agree" button, it didn't do that the first time, it then asked me to enter a password for the rokudev user, it didn't do that the first time either. I can now login to the web page. Just about to side load the Emby app now! Edited by cw-kid, 05 September 2015 - 07:28 AM. Got Emby installed The UI seems a bit snappier and quicker now when navigating around. I set the Now TV box to 1080p display in its settings. It doesn't seem to play 1080p MKVs that well even on the LAN cable? Just tried to play "300" which has DTS audio and it was playing a bit and then stopping then playing a bit. 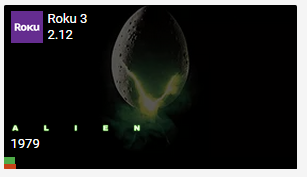 Then tried "Aliens" that took a good while to start playback, says "retrieving", it played for a minute or so and then says Loading, please wait. This title has DTS audio as well. Looking on the Emby server I can see its transcoding so is probably hammering the CPU on my little HP Microserver. I then tried "The Lord of the Rings" which is 1080p with AC3 (Dolby) audio and that played longer for about 5 minutes until it then also said Loading, please wait. Maybe its just down to my HP Microserver not having the CPU power to transcode on the fly for 1080p. Also anyone know can these Now TV boxes do audio pass-through to an AVR ? Which MicroServer is it, as the older N36L that I had was too underpowered for transcoding. Just playing a 720P MKV now and that has played for like 10 minutes OK but just buffered quickly then and started playing again after few seconds. Oh well, I can't change my file server easily. This second Now TV box is for my parents house anyway's, so as long as it plays all the SD content that will have to do. What setting do you have your server set for transcoding? Also, you could possibly look into Cloud Syncing for your parents to stream from. Can't help here, I have an i7 doing all transcoding but have a special movie collection for all remote users which requires little to no transcoding. OK got the new box installed at the remote house. Was having issues with all artwork and images not being visible anywhere. It did this previously on the old white box when I tried to setup a SSL connection, had to use HTTP in the end. Maybe editing that ServerScreens.brs file to enter the domain name was making the Emby app connect via SSL on that port? In the end to get it working I had to delete the Emby app and install it again with out the edit to the ServerScreens.brs file. I also had to setup the connection again in the Emby app preferences and as soon as I selected the HTTP port it started working and all the images were then visible. The new black box has no 3.5mm audio out jack I just noticed and I was using that on the old white box. Had to use the TV audio out instead to the analogue amp. One problem now, in the Emby app it seems I have to press back button twice. If I go in to Movies for example and then press back it just says Retrieving on the screen, I then have to press back again to get back to the main page. It did this on my LAN as well earlier. Any one else having to press back twice? ?